Cologne - The tightest relegation battle in Bundesliga history is going to go right down to the wire with a third of the clubs still fighting for survival heading into the final round of matches. Even Hertha Berlin up in 13th cannot start to lay back and enjoy their summer just yet with everything still to play for, and nothing to be decided before approximately 17:20 CEST / 15:20 GMT on Saturday. To help work out who needs what to stay up, bundesliga.com has all the relegation permutations for the six clubs who will be scrapping for their lives for one final 90 minutes of intense and dramatic football in the 2014/15 season. If they lose by two goals or more (scoring fewer than three themselves), Freiburg draw with Hannover, Stuttgart win and HSV win by a big enough margin to overturn an inferior goal difference of 12. If they lose to Freiburg by more than a single goal and Stuttgart pick up at least a point and Hamburg do not win, or if they lose to Freiburg, Stuttgart fail to win and HSV win, or if they draw against Freiburg and Stuttgart win. If they lose and both HSV and Stuttgart win, orif they lose by more than one goal, Stuttgart draw and Hamburg win. If they lose in Paderborn, or if they draw and Hamburg win, unless Freiburg beat Hannover by two goals or more. 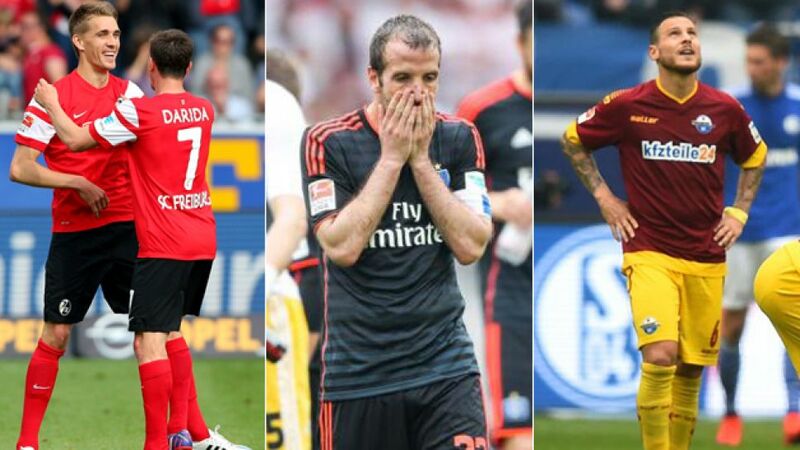 If they beat Schalke, Stuttgart do not win and the Hannover-Freiburg game ends all square. If they fail to beat Schalke, or if they win their own game, but Stuttgart win and Hannover-Freiburg ends all square. If they lose or draw against Stuttgart, or if they beat Stuttgart, but HSV win at the same time.